A complete All-In-One solution for 24/7 outdoor advertising. With a built-in media player for local updates via USB or optionally upgrade to an internet based content management system for remote control. You can also add a touch screen for interactive content, making it ideal for way-finding and tourist information displays. This is a simple way to advertise outdoors providing an easy outdoor ePoster solution for effective digital signage. The 2,500 nit high brightness LCD screen is visible in all weather conditions and secured inside the rugged IP65 rated enclosure. Fully weather-proofed and protected from the elements as well as casual vandals. The sleek design can be used with or without the base plate and is easily fixed the the floor by four bolts. Power, and optionally data, is all that is required to get your digital signage up and running. The built-in Android media player offers simple plug’n’play media playback of images and videos and is designed to be easy to use. For more creative control you can upgrade to the online Content Management System (CMS) which allows you to create different zones on-screen, feature live data from the web such as weather and news, and most importantly monitor and upload your content remotely from any internet enabled browser. The CMS can also be used to drive the touch screen option should you wish to add interactive content to your display. 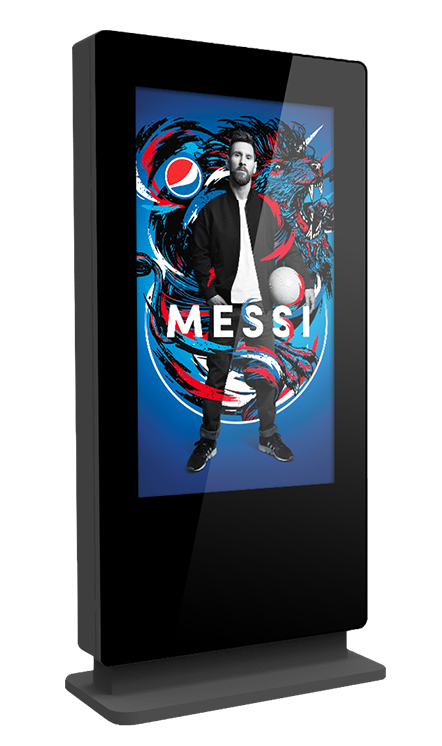 You can also run your own Android native digital signage applications on the built-in player. If you would prefer a different signage platform there is room inside the totem to connect your own third-party media player or PC. Brightness is key when using outdoor Digital Signage, our Outdoor Freestanding Digital Posters use Ultra High Brightness panels (2,500cd/m²) more than 8 times brighter than a standard LCD panel to allow easy readability in direct sunlight. An ambient light sensor reduces brightness when needed while maintaining visibility and reducing running costs. Suitable for the harshest of outdoor conditions – designed with a robust outer casing to give protection from both the elements and the public. They are coated in a new special enamel paint that is even harder wearing than ever before; improving the overall durability. The outer casing has an IP65 rating which means it keeps out all airborne swarf, dust and other particles as well as being protected from any wet weather conditions; broadening the range of possible environments. 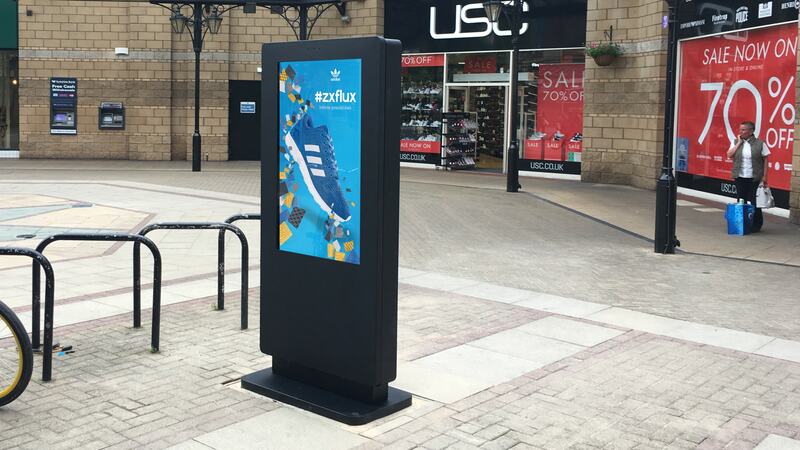 The outer casing of our Outdoor Freestanding Digital Posters is made from industrial grade thick steel suitable for all locations. With a scratch resistant glass front that covers the entire front face of the screen giving the display a stylish tablet-like aesthetics with optimal clarity. Controls and openings are hidden and not accessible by passersby. Not only are these displays able to withstand hot and cold surroundings but they are able to manage the internal conditions to maximise the life of your product. Built in air-conditioning can now be tailored to allow the display to work at an optimal level in any climate from -20 °C to +50°C at 10% – 80% humidity allowing your message to be seen 24 hours a day. These screens can display interactive content allowing your visitors to select their own content. As the touch sensor is plug’n’play you can use any third-party media player or PC that supports touch, or upgrade the internal media player to the on-line CMS which enables you be to build your touch content and upload it to the screen remotely. 49″ & 55″ models are available for immediate delivery. 43″, 65″, 75″ & 86″ models can be made to order. * Built-To-Order Items. All screens come with 3 year warranty and lifetime telephone support. All prices ex-VAT and subject to change. Price includes delivery within mainland UK, certain exceptions apply. Discounts available on multiple units. Please contact us for a formal quotation. For full details please contact us on 01462 433558.